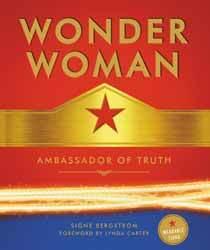 Wonder Woman: Ambassador of Truth is a luxe hardback released in the wake of the general adulation and excitement generated by the success of Patty Jenkins' film released in May this year (2017). It purports to be a celebration and exploration of the character's 75 year history but that's more than a little bit of an exaggeration. Although there is a pleasing bevvy of WW imagery from all eras of the Amazonian heroine the book is definitely skewed toward the modern incarnations and the blockbuster in particular. This is fine and hardly surprising given its worldwide success. Jenkins was only the second female to helm a film with a $100m budget, a film which subsequently became the first female-directed movie to score a $100m plus opening weekend, the highest grossing film directed by a woman to date etc etc. So it being the driver behind this book is neither unwelcome nor problematic for me. It's a quality publication and the illustrations and photographs are numerous and well selected from a vast resource. There are even a few cute reproduction extras inserted like a 1940s era valentine card and a 1970s animation cell. As a coffee table book for a newbie or casual fan it would be well chosen. The accompanying text falls into two camps. A series of essays about all things Wonder Woman and interviews with notable creatives (writers, producers, artists etc) who have worked on WW's various outings. The essays are the book's weakest link. It's telling that the credit for Signe Bergstrom refers to her as "a writer and editor of more than thirty illustrated books" as her prose is clearly meant only as a very light-touch filler between the strong images and the informed interviews. There are various sections on WW regulars like Steve Trevor and Etta Candy, Diana's assorted weapons and WW history but the writing is shallow, repetitive and frankly poor. Hackneyed phrases like "not bad for a girl who..." really grate. In fact the overuse of the word "girl" is notable. One especially jarring moment came when the writer referred to WW as being "mired in feminism" when it was clear from the context of the sentence she meant "entwined". Is there a proofreader in the house? Suffering Sappho! The final chapter is especially cringeworthy; ultimately stating every strong female ever fictional or otherwise from Katniss Everdeen to Diane Von Fustenberg is a product of the existence of Wonder Woman... hmmmmm. One has the impression were she writing a book on Queen Elizabeth the First very little of the substance would differ. Every chapter of strung together cliches and trite phrases feels like it was produced by a random content generator and it made me itchy. There are heaps of missed opportunities here; most strikingly how Bergstrom talks about WW in relation to feminism frequently as is to be expected, she was conceived as such by creator Dr William Moulton Marston and has always been ENTWINED with feminist ideology.This is mentioned often but never explored. Wonder Woman is inarguably a feminist icon... yes... but why? Is she a good one? What about her different incarnations and how that reflected the zeitgeist of the time. Why does she resonate or endure? What about the fact that despite being one of the "Big Three" (Batman, Superman Wonder Woman),and having massive fan loyalty, there are comparatively few movies / TV series in relation to vehicles for Clark and Bruce. Why can't you find Wonder Woman pyjamas in the boys section? And why are so many of those chosen to helm Wonder Woman output male? (In the interviews with various WW related creatives the men outnumber the women two to one). At least the 12 "conversations with" are much meatier than the fluffy prose. Conducted by seasoned entertainment writer Tara Bennett these interviews, with the likes of Cliff Chiang and Gal Godot herself, offer much more insight into what sets Wonder Woman apart from other heroes. Trying to get to the heart of what makes her so popular, as well as illuminating some of the logic behind the various creative decisions, and tackling questions such as how Diana deals with the dichotomy of being primarily a peacekeeper, yet having to fight to maintain that peace. Again, these are clearly skewed towards the modern era but this does lend them cohesion and, as they are conducted specifically for this book, they retain some freshness. In summation it looks great and would make a good present particularly for those coming to Wonder Woman off the back of the film, but long time fans probably wouldn't find enough new here to justify the price tag.